My artwork or idea was not inspired by any artist or public figure. I looked at the project theme and asked myself what I think are the major problem with the world and Islam. I asked myself many questions like: what did we do to non-Muslims? What is it that makes us different? Do we fit to be on this planet? Are we less of humans in others’ eyes? But then I realized my mum always said, “Fix the monster in you before you start pointing at other monsters”. Whatever unrest between Muslims and non-Muslims cannot be fixed until we fix what is within our walls. This theory inspired my project. I inclusive, we tend to think one Muslim is better than another or the ways of one Muslim is wrong just because it is not like ours or an Arabian Muslim is better than the African Muslim and many other absurd beliefs. I also went forward to ask myself, “On a normal circumstance, can a mango grow on apple tree? Obviously not, we would wait eternally to see it grow.” The tree I drew represents Islam as a religion. 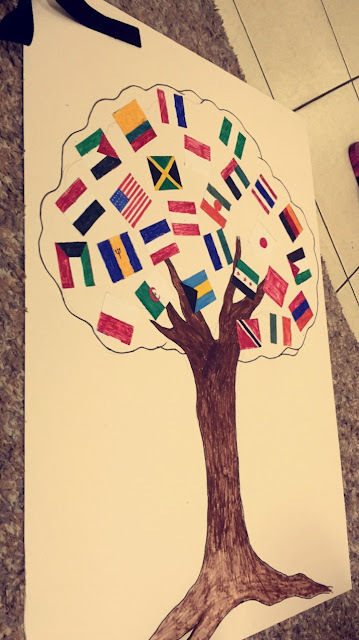 The flags represent the countries in the world from a random selection as the fruits of Islam. We can never see ourselves as the same until we start to view every Muslim as a part of tree trying to wait for destiny or end reward. One person has no right to criticize or judge another’s lifestyle unless it directly affects him or her. Islam does not accommodate racism or stereotyping or gender maltreatment or maltreatment of any being so why should we adopt it as a lifestyle and call it Islam? We can only fix our issues when we practice the religion the way it was brought from Allah and the way Prophet Muhammad (S.A.W). After all, the Prophets mentioned the Qur’an all came from different parts of the world, which proves equality. Other people cannot see the religion as a beautiful religion that promotes peace if we don’t show them through our actions and attitudes. Children have to be educated from a young age that we are all humans and the same. They also need to be told that people have little insignificant differences due to cultural and geographical differences and only Allah knows why he made us all that way.